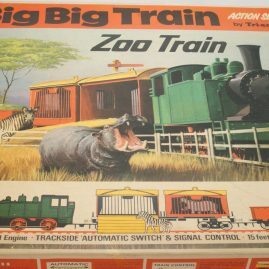 Since the introduction of Big Big Train some 14 sets were produced. Where the solo models came in the characteristic yellow boxes the sets were packed in colorfull boxes with pictures or nice artwork. The interior was cardboard with cut-out spaces to fit the models etc. Also some sets came in see-through boxes with transparent cover and the base was made of styrofoam or molded plastic to fit the contents. Finding a boxed set in good shape is not easy. 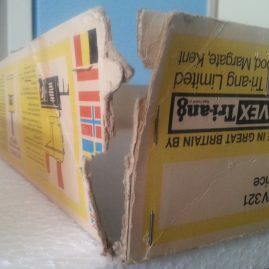 The cardboard boxes are usually very worn. The transparent covers usually get damaged easily over the years so these sets in mint boxes including the cover are very rare. I am happy to have some sets in my collection that are in a very good shape and even the sets I own without the covers are a very nice display. The picture below links to the sets photo gallery showing items from my collection.